Tatura trellises are most commonly used on stone fruits like peaches and cherries. This installation of pears, which are spur bearers with radically different pruning requirements, is less common and experimental. 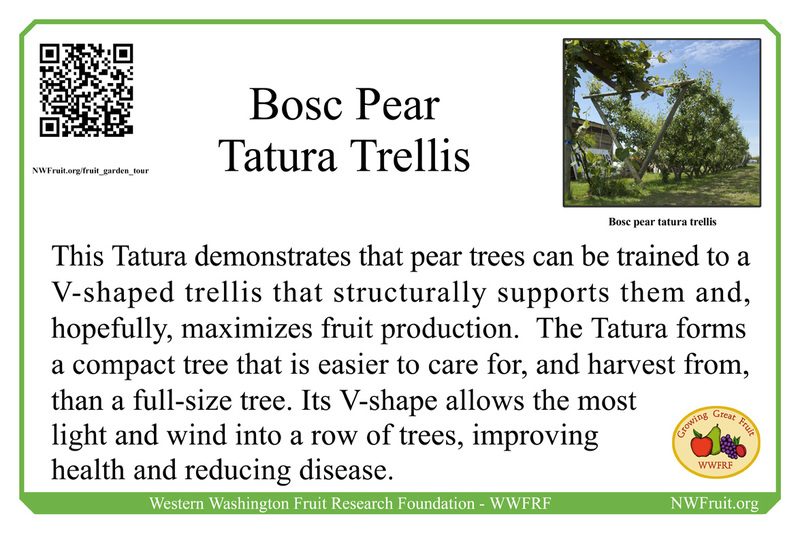 Bosc pears on the Tatura trellis in the WWFRF Fruit Garden were grafted onto Quince A and C rootstocks on a 4-foot spacing. The original grafts did not take due to incompatibility issues, so an interstem of Comice pear was used. The Comice whips were trained to a Y shape and then, onto each arm of the Y, Bosc pear scions were grafted. This formed a Y-shaped Bosc tree that was trained to the V-shaped trellis. The Y-shape stands in contrast to the alternating whips trained to either side of the V on neighboring Cherry Tatura. The whole process of grafting, inter-grafting, and training took several seasons. This trellis is oriented East-West, but trellis systems should normally be oriented North-South. The trellis consists of five wires positioned on each side of support poles set at a 60˚ angle. The first wire is 2 feet from the ground, and each wire is set 1-foot apart, with the top wire at 7 feet. As the trees grow, two scaffold branches are trained onto the bottom wires, one on each side of the V-trellis. 14 of the 16 pear trees have a central leader with horizontal cordons trained to each of the 6 wires. However, two of the trees have only the two cordons trained to the bottom wire. From those cordons several verticals were allowed to grow and were trained to the higher wires, forming a candelabra shaped tree. This is part of an experiment to see which method is more productive. So far, the central leader with horizontal cordons is winning. The Tatura trellis was developed in the 1970s at the Tatura Research Station, near Shepparton, in Victoria, Australia to assist in the mechanical harvesting of fruit, especially canning peaches. Another goal was to allow mechanical pruning, using a hedging machine. In the years since, other advantages and disadvantages of the system have been realized. Trees trained to the Tatura trellis are easy to pick. Good light penetration enhances fruit ripening and flavor. Increased air flow through the tree reduces fungal diseases like scab. Smaller trees reduce chemical cost. The 60 degree post angle is perfect for training and maximizing fruit production. Disadvantages: Tatura trellis systems are not compatible with vigorous rootstocks that require excessive pruning to constrain tree size. Quince rootstocks are hardy in Western Washington, but they are not reliably hardy in Eastern Washington and many other parts of the USA. Since the trellis must support the total weight of the tree and its crop load, it must be exceptionally sturdy and such a trellis can be expensive to build. The work of pruning and training trees to the trellis can be labor-intensive. Pears put on new vertical growth each year and this tends to fill the space in the middle of the V. These branches must be pruned off during the summer. Quince C is the most dwarfing rootstock for pear, quince A is a little more vigorous. The Bosc Pear Tatura Trellis is a publicly accessible comparison between the two. Volunteers in the Fruit Garden have noted that the Bosc pears grafted onto quince C on the west side have less growth to be pruned off in the center of the V during the summer than the ones on quince A. Early July, before the trellis is pruned, is a good time to visit the Fruit Garden to compare the effects of quince A and quince C on Bosc pear trees. Quince rootstocks are not reliably hardy in areas where the winter temperatures get lower than -5 degrees F.